Mamma Mia! 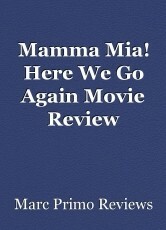 Here We Go Again Movie Review The following is a movie review “Mamma Mia! Here We Go Again” by Marc Primo Pulisci. “Mamma Mia! Here We Go Again” proudly uses only a few of the songs featured in the prequel. Significantly more detailed than the first Movie. Donna Sheridan (Meryl Streep), the American lady who remained on the (invented) Greek island of Kalokairi, fabricated a little lodging, and brought up her girl, Sophie (Amanda Seyfried), there, she passed on. After her mom's demise, Sophie, who's around twenty-five, has wrapped up the inn and is getting ready—with the assistance of Sam (Pierce Brosnan), one of her conceivable dads, and the person who wedded her mother toward the end of the first film. She's seeking after her other two dads, Bill (Stellan Skarsgård) and Harry (Colin Firth), to show up. Written and directed by Ol Parker, Richard Curtis, and Catherine Johnson. In “Mamma Mia! Here We Go Again,” the past takes center stage. Flashbacks, set in 1979 and 1980, show the viewer the story of Donna when she graduated from college (Oxford). It makes nostalgia and a protagonist. We see Donna headed to Kalokairi, making her way through Paris. The younger versions of Donna, her friends, and lovers, are the heart of the movie. Lily James, as young Donna, brings great depth to the character. A notable difference in this sequel is the choreography takes a few steps up. Anthony Van Laast (Choreographer), creates numbers that are more exquisite and complicated than seen in the first film. The story, when it comes down to it is of a strong and independent woman who follows her heart. Donna successfully makes her plans happen and as a single mother raises a brilliantly capable girl. Sophie finds herself without a mother and curious about the absent father figure in her life, she summons three men that fit the bill to of her father; Three good looking dorks that left Donna to make something of themselves, even though success did find them they keep a void in their hearts. Through Sophie, they come back to Donna and find a family that they could see themselves in, filling that inexplicable void. The new movie is brought to life by the deepness each character brings to Sophie’s life however brief, Cher, as Ruby, Donna’s mother and Sophie’s grandmother for example. Laughter joy and sorrow all in all a great experience. Not many musicals can boast such a well-rounded cast and use of talent. Please watch and enjoy. © Copyright 2019 Primo Reviews. All rights reserved. What do Women Love about Men? 'Travel revenge' on China, US?